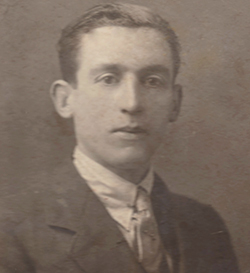 William Sims, known as Bill, was born at Tobacco Box on 2 August 1895 to William Henry Sims and Elizabeth née Barton. He attended school in Frampton and on 23 March 1906 won first prize (a watch and chain) for the highest number of marks obtained in the weekly examinations held since Christmas. By 1911 he was working as an under gardener. Although Bill's war service is commemorated on the plaque in the village hall alongside that of his younger brother, Timothy John, no records have been traced. His family believe that he served in the Army. Bill never married. He lived with his sister in Moreton Valence and used to cycle from there to work at the Royal Agricultural College, Cirencester, where he was employed as a waiter. On 22 September 1956, William Sims was killed in an accident on the main road between Stroud and Cirencester. He was buried in the churchyard of St Mary's, Fretherne.